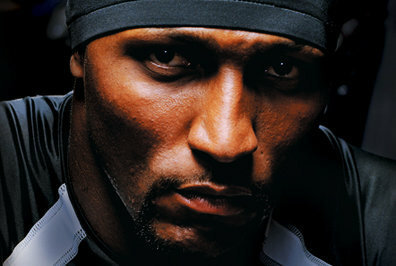 Baltimore Ravens middle linebacker, Ray Lewis, was on Monday Night Football tonight. Dressed to the nines and professional as ever, he was interviewed by Jon Gruden. I love Ray Lewis. He is my favorite football player. Scratch that. He’s my favorite athlete, though I’m not even a Ravens fan. Ray Lewis has been in the NFL for 16 years, and he plays like it’s the last time he’ll ever be on the football field. Ray Lewis loves football. I mean absolutely loves football. He is as intense as they come. I can only imagine what great things we all could do with half as much intensity, passion and dedication to our chosen profession as Ray Lewis. Every game, every play, Ray Lewis gives everything he’s got. According to him, he has to. He would never let a teammate down. He learned from Mike Singletary, that as a leader, you have to control your emotions. Ray Lewis is an amazing man to watch. If you don’t know of him or haven’t paid attention to him, I dare you not to be mesmerized by him. To not want to be led by him. I will watch a Ravens game just to watch him lead his defense. As Ray told Jon Gruden, a leader is willing to serve, willing to shed pains and puts himself last in order to lead. When asked why he’s so intense and so dedicated all the time, he said it’s because he’s got kids. He told them if you ever start something, finish it. Ray Lewis wasn’t in the University of Miami media guide when we got to the campus to play college football, but he boldly told them he wanted to be the greatest defender to ever play the game. He’s certainly made a pretty darn good case over the past 16 years in the NFL. And I’m inspired to watch, both as a football fan and a leader. He is a stud that keeps his play at an incredibly high level year after year. I am tempted to think him and Ed Reed are getting too old but they show up each year to lead a really good defensive. It’s amazing, isn’t it? I’m a big Ed Reed fan too. They just go out there and lead that defense year after year. Thanks for reading! There is always the fine line between admiring sports stars for their physical qualities while ignoring their character. It’s especially nice when the two come together. Very well said, Ginny! Thanks for reading. Sorry Jennifer – gotta disagree with you on this one. I’m a huge football fan, and really admire many NFL players for their athleticism and leadership abilities. But Ray Lewis is not one of them. He managed to skate out of a murder conviction in 2000, and has the reputation of being aggressive and a rather not-so-nice individual. My respect for NFL players has to take their off-field activities into account (don’t care who their married to, but do care about how they treat their wives, families, etc.) in order to find that respect for them. Ray Lewis is one of my least-favorite players – right along with Ben Rothlisburger. Well, I guess we’ve found something to disagree on. 🙂 I’m not going to defend him on the murder allegations, but I will point out that no one was actually convicted in that case. I remember a lot of talk, but not a lot of truth from any side. Innocent until proven guilty. (With that said, I’m with you on not liking Ben Rothlisburger. It’s all about your perspective, I suppose.) He’s come a long way since 2000. I also don’t think he’s known as a not-so-nice individual, unless you’re talking about his bruising playing style. He’s pretty popular and has earned respect from around the league. He’s very charitable and has an incredible work ethic. His intensity is what gets me. Of course, I’m rooting against him next week against the Patriots. I have my allegiances! I definitely don’t mind his playing style – he’s actually a pretty clean player for all his aggressiveness. I have much more respect for him on the field than off. Yeah, I hear you about the innocent until proven guilty deal – I’m usually pretty good in that regard, but there’s something about that whole case that didn’t sit well with me. He gives me the willies when I hear him talk about stuff other than football.